Starting a consulting business with no experience is easy. Today, anybody can start their own consulting business. If you have a computer, a phone, and a place to do your work, you have everything you need to start a consulting business. What’s not easy is building and sustaining a profitable consulting business with no experience. If you think you must “feel like a consultant” before you can start your own consulting business, you’re mistaken. Instead, what you need is real expertise and experience in your area of specialization. With that, you have the foundation of what it takes to start a consulting business. You can develop “consulting” experience on the business side of things once you’ve started your business. That will come. 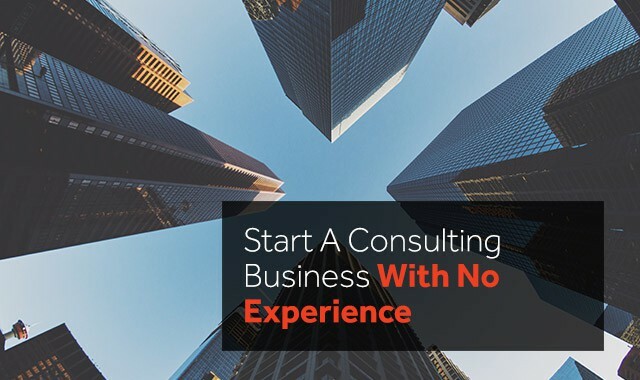 If you’re interested in starting a consulting business without experience on the business side (but with an area of expertise), this article outlines how you get started. Is Being A Consultant Truly Right For You? Part 1 – Is Being A Consultant Right For You? I could paint you a soft and cuddly picture of how rosy the life of a consultant is. That would be a load of rubbish. Becoming a consultant — and a successful one to boot — isn’t for the faint of heart. Especially when you’re trying to do it with little experience. But you can do it when you adopt the right mindset. If you’re like most people, you want to start your own consulting business to realize your full potential and become your own boss. Becoming your own boss, realizing your full potential, and having a flexible schedule account for nearly 75% of the reasons why over 33,0000 consultants we polled actually started their own consulting business — many without former consulting experience. Very little in life and in business is easy. Consulting is no different. Being a consultant is much the same as being a business owner. That’s what you are. All the headaches, ups and downs associated with owning a business will become part of your everyday life as a consultant. There’s finding new clients, getting agreements signed, invoicing and billing issues, client management issues…the list goes on. There are lots of different aspects of the business you’ll need to stay on top of to keep things afloat. Don’t let me scare you away from joining the consulting ranks. That said, it does take a lot of work. For many, getting up and going to work for 9 am and then coming home at 5 pm is a better way to live life. In some ways this is true, you go to work do your job and come home — that’s it. When you become a consultant, I can tell you that you’ll be thinking of your work and clients much more often than that. Check Yourself — Are You Determined To Succeed? To start a consulting business with no experience, pig-headed determination is required. You’ll deal with quite a few blows during the tough times…but if you’re serious about succeeding, you’ll make it out the other side with invaluable experience. More importantly, you’ll need the ability to stay focused and constantly motivate yourself to not give up and keep pushing forward. These are some of the key areas that will help you to decide if becoming a consultant is right for you. If you’re looking for an easy, comfortable life, starting a consulting business with no experience is not for you. But if you’re willing to accept the challenges that come with the advantages, read on. So you’ve decided to make the leap into becoming a consultant with little to no experience. You’re willing to start your business with no experience and learn along the way. The first step is to decide what area of consulting you’re going to get involved in. You probably have a consulting field in mind. If your background is in finance then financial consulting is probably where you should be headed. Think about your past work experience. Even if you don’t have any consulting experience, you do have experience working for others. Where Do You Have Experience? If you’ve been a marketer for years, then becoming a marketing consultant makes the most sense. This isn’t to say that you can’t venture into a completely new area. But if you’re to look at the entry point of least resistance — and make your life easier — you want to jump into a consulting field where you’ve got skills. You’ve already built up some credibility and can demonstrate some results. Even if it’s results you’ve gotten for your employer. Remember, a consultant isn’t just a contractor that a company pulls in to get work done. A consultant provides expert advice and recommendations. And it’s hard to make recommendations if you don’t have any past experience or knowledge to pull on. If you’ve worked at a job in a field, you do have some past experience. Even if it’s just a little bit of experience, you want to leverage that into value for your clients. Starting A Consulting Business With No Experience — Mission Impossible? Nothing’s impossible. If you really want to start a consulting business with no experience in a given field, be prepared. You’ll need to devour as much literature and education you can get your hands to learn the ins and outs of the subject. That said, the biggest mistake most new consultants make is thinking they have experience in an area when all they’ve done is read a bunch of books or blogs. Reading makes you knowledgeable, it doesn’t make you experienced. For that, you need to put skin in the game and get your hands dirty. Practical experience teaches you more than any book ever will. Another consideration for you is to choose an area that you’re passionate about. As I mentioned in Part 1, one of your biggest challenges will be to keep yourself motivated and moving forward. It’s very hard to do that if you don’t enjoy the work you’re doing and if your area of focus doesn’t stimulate or excite you. I hope this has given you one or two things to think about when choosing what area of consulting to enter as you become a consultant. In Part 3, we’ll look at how to make sure your consulting services stand out and get noticed in the marketplace. What makes your consulting services unique? You’ve decided you’ve got what it takes to start a consulting business with no experience, and you have the necessary skills to give yourself some credibility to get into the consulting game. In order to make any money in this business, you must make yourself known and sought for consulting work. Getting found is actually the easy part. There’s plenty of marketing avenues you can take to get your message in front of thousands — if not millions — of people. Nearly 50% spend less than $1000 on their marketing each year. I’m not saying that you have to have a five-figure marketing budget to be successful — but you must adopt the mindset that investing in your business will pay off. Getting in front of people takes time, money — or both. Either way, you need to provide something unique that stands out from the crowd if you want anyone to give you the time of day. This all comes down to your positioning and USP (unique selling proposition). The easiest way to think about this is to put yourself in the position of your prospective clients. Think about what they really want. And also look for cracks in the market. Look at all your competitors and find an area where they all are performing poorly in. Or maybe there is something that isn’t being communicated well enough — but is important to your prospective clients. A classic example is to think of a construction crew. Most are notorious for cost overruns and delays. Not to mention shabby work that needs re-dos and touch-ups for months after the project is supposed to be complete. Customers hate how late and unreliable these workers are. If you’re in this market, you’d be wise to take this opening and promote how your workers are always on time, are reliable and get the job done right. Think this will only work for this market? Well, think again. Dominos pizza took this exact approach by guaranteeing delivery would be on time, and that the pizzas would arrive steamy hot. The goal is to figure out what you bring to the market that is unique. How can you set yourself apart? Can you focus on an area that others don’t? Can you provide a guarantee that your competitors don’t have the stomach for? While doing this can be scary at first, these are the kinds of things that make you stand out — and that’s what you need to make happen. This is an overview and we’ll get into more specifics in more advanced articles. For now, think about what your advantage is and what you’re ready to offer as you become a consultant. This is one of the most overlooked areas for new consultants. They focus on creating a website and logo, they get business cards printed, they set up their office space and they give themselves a catchy name. Then they go out and try to find clients. But there’s one big gap in this plan. What are you going to do when you get a client? When I first got started as a consultant, I winged it. I went in and figured things out without a written plan. But I don’t recommend that approach. You don’t need to plan out a hundred page system for your clients from day one — that would surely be a waste. If you’re starting a consulting business with no experience, you should have a written plan of how you can help the clients you get. This is as simple as writing the areas you can take them through, what needs to be done in each area, and what the end result will be. Don’t fret, this can be in a simple point-form list. It will not only help you better explain what you’ll do for potential clients. It will also make your work process more efficient as you work on the project. This may seem like a no-brainer but you’d be surprised how many consultants have no real plan for their clients. And without a plan, it’s infinitely more difficult to achieve real results. Writing out a plan or system for your consulting projects is one of the first things you can do to gain experience. Here’s the fastest way to get consulting clients: know the right people. The more people you know, the more people you can approach and tell them about what you’re doing. It’s a simple conversation starter. Sooner or later, someone will know someone. Or maybe even a family friend will be a potential client — and you’ll have landed your first deal and have really become a consultant. But what if you don’t know anyone? There are many approaches you can take. Some will depend on your industry and others on your budget. 44.4% of consultants cite the majority of their business coming from referrals. And 20.7% cite the majority of their business coming from networking and events. Despite what everyone else tells you about online marketing — personal relationships are still king for winning consulting business. But turning potential buyers into new clients comes down to your marketing. Get your message in front of them. Make them an offer that is hard to refuse. Repeat steps 1-3 over and over again. This may sound ridiculously simple to you — but it works. Let’s break down each of these 4 steps in more detail. Do you want to approach entrepreneurs, single retail stores, franchises, or large organizations? To decide this, you’ll need to decide who your ideal customer is and what type of customer you want to work with. You may not know right from the beginning. That’s ok.
Just be sure to select one group at first and focus your efforts on getting business from them. What you’ll need is a list with company names, the person in charge of your area of expertise, and contact details. Now, you can start communicating with them and reaching out directly. If you’re wondering how to get this info, you’re already in the right place. The internet — specifically sites like LinkedIn — gives all this information to you. Read our article on leveraging LinkedIn to attract new consulting clients. Once you have your list of ideal clients, you now need to get your message in front of them. You can do this by sending them a letter in the mail (which I recommend), an email, or by calling them. Your communication piece needs to be well thought out. It needs to grab their attention and give them a reason to contact you. This is the first step. Every client project begins with them receiving your first message. Be clear on your offer and advantage. We covered this in Part 4. Your offer needs to be distinctive and solve a problem the potential client has. When you describe the problem they have and how you can solve it, they can’t help but notice. It’s not enough to state the benefits of your service. You need to convey it in a way that removes almost all the risk and hesitation the person may have. You can do this by providing a powerful guarantee. Another approach is to create a presentation or report that is packed with information useful to that person and get them to contact you to receive it. Your goal in the first communication is to get them to take action and show sincere interest. No one wants a client that isn’t motivated — and these types of clients don’t buy anyways. This final step is probably the most important. Most marketing fails because of a lack of follow up. Think about the most successful realtors in your area. Who are they? They’re the ones that keep getting your face with calendars, mailers and other communications month-after-month, year-after-year. Studies show that it takes 7 or more communications or touches to turn a prospect into a client. Give up after 1 or 2, even 3 or 4 for that matter — and you might as well not get started. 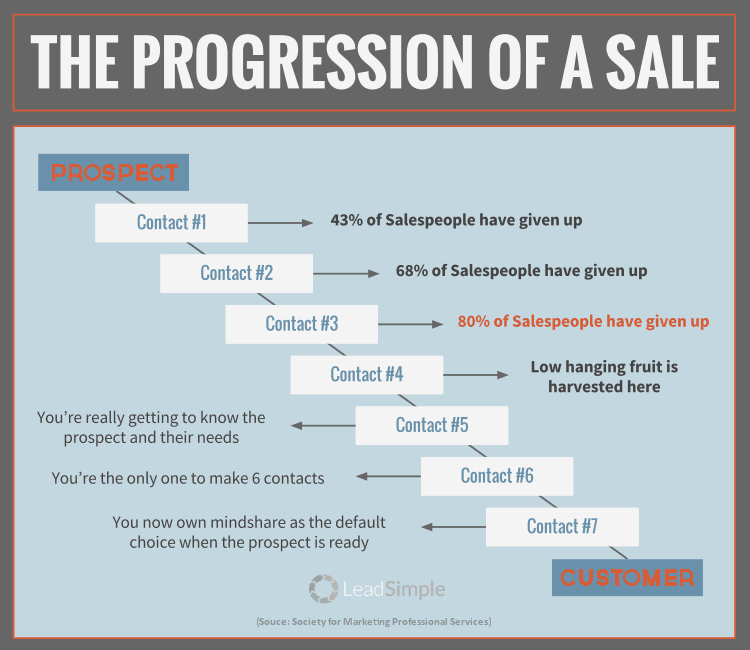 Replace “Salespeople” with consultants and you’ll find the same thing. 80% of consultants give up after 3 contacts — and after 3 touch points, you’re only about halfway there. Why does it take so long? Because business is all about relationships. And relationships take time to form. There are many other ways to find clients. Consider this an introduction for the new consultant with more to come as you get into the business. But one key principle is this — the follow-up is critical to winning new consulting business. And it doesn’t take any experience to be persistent with your follow-ups. It takes the right mindset. Now that your marketing has paid off, your busy working with your new clients. At this point many consultants fall into a trap — they don’t take good care of their clients. They say they’ll call on a certain day or time — and they don’t. When they schedule a meeting, they show up late. They promise to send materials over – they never do. And most frustrating for clients…they don’t show any ongoing progress. Your clients are your business. Without them, your business is in trouble. So treat them like gold. Even a basic level of professional communication will set you levels above your competition. Do what you say you’re going to do, and follow through. Always. Give your clients gifts or do something to show that you appreciate their business from time to time. All this takes extra effort, but it’s worth it. Most of my clients are clients not for weeks or months — but years. And it’s all about delivering as promised and treating your clients like you care for them and appreciate them. Consulting is a relationship business, so make sure your relationships with your clients are rock-solid. Keeping them happy with great work is the best ways to get new and repeat business. Starting a consulting business with the help of the experts will help you develop your business much faster — and with far less risk. Anyone can get started in the consulting business. But only a few will stay. At Consulting Success, our products and programs are designed to give you true staying power in your consulting business. 24.3% of consultants are earning $120,000 and $540,000 per year — and 44% of consultants in this earning bracket have less than 4 years of experience. We don’t make any promises as to how much you can earn (and it can be much, much more than that). That’s up to you. But we’ll tell you everything you know about helping you reach six or seven figures and beyond with your consulting business. 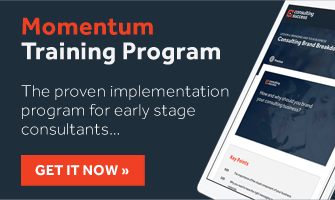 If you’d like to learn how to build up the consulting practice you’ve always wanted and consistently attract high-value consulting clients, we’ve created a program just for you. Join 300+ consultants who have added six and seven-figures to their annual revenues with a proven system in our Clarity Coaching Program. If you’re serious about building a profitable, sustainable consulting business and reach your true potential — we invite you to take a look at our coaching for consulting program. You’ve got the expertise in your field. Our program will help you master the other areas you’re not as comfortable with (like marketing and sales) so you can have a steady stream of high-paying clients.